Well no special coding today. Instead I had to talk to an arborist and then head off to city hall to get permission to remove a tree. There's a really nice big cedar that's been outside my house since I bought it. It kills anything you plant underneath it and occasionally you have to chop a couple of lower branches but its a nice big tree. Over the summer we noticed it was losing some green but we figured it was just a dry summer and it would pick up when the rain came. 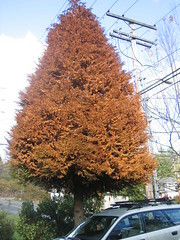 Instead the whole tree has turned brown in the last 10 days. 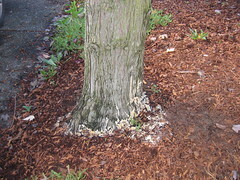 Yesterday we noticed something mould like growing up the base of the tree - its actually growing fast enough to see its bigger today. So I called in an arborist to take a look. "Its dead" - he didn't even need to see the fungus. "The roots will be like mush - you need to cut it down otherwise it will eventually fall down"
So now I have to get the city to give me permission. Thanks to all the stupid builders who think clear cutting a plot to build a Mega Mansion is a good idea we now all have to ask before we do anything. So in up to 10 days I will get the permission and then I pay a simple $200 to get it removed. So this morning I clicked on my favourites link for the XNA forums - I'm still going to check the super secret MVP forum to see if there is anything important happening - and saw the 163 posts unread. I really had to fight the urges.... a couple of interesting posts caught my eye and I read them and resisted the urge to reply. I checked the mod forum and there was nothing new - the usual boring stuff. Requests for bans for the spammers (whats that you never see spam in the XNA forums? That's because the mods are VERY quick at deleting the posts and getting the account banned. Some of the best and most level headed mods about if you ask me....) and then..... I closed the browser. Yes I left 163 posts unread. Now I'm taking some deep breaths and blogging to get over it ;-) Depending on who you believe it can take 14-28 days of change to break a habit and believe me those forums are like crack to me. Posting in the forums is fun but I am spending far too much time in there. Heck I quit Microsoft to write games and so far the only ones I've completed are the starter kits for Microsoft. Posting in forums and being the top poster gets to be a bit of an addiction too. I find myself wondering if I've got the unread post count down to zero instead of doing productive things. 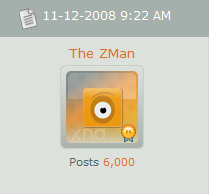 In 603 days I've posted 6000 times (and edited those darn FAQs so many I have lost count) and read over 50,000 threads (over 100,000 posts in those threads). Like all great retirement announcements you know I will be back but I have a big list of other things I want to do before then.